1. Grief is a common experience that is shared by all. Sadly, this reality creates a need to have grief and funeral resources available for immediate purchase. 2. Often, the passing of a loved one comes unexpectedly, where there is a 1-4 day window of time to prepare a funeral or a memorial. In these instances, waiting for the shipping of materials are impractical and families rely upon local resources, such as a local bookstore, to help them obtain poems, quotes, and readings for obituaries, life sketches, and memorial tributes. 3. Poems are commonly selected as a part of a funeral or memorial tribute, or as part of a life tribute at a wake, or an unveiling service. 4. There are very few contemporary poem sources for funerals, wakes, etc. Funeral Poems And Reflections - Vol I is one of these rare poem sources that are original, and created for our current time period. 5. Poems And Reflections LLC provides a list of bookstores that carry this book and have it in stock for immediate purchase. This allows these customers to be informed of ways that they can purchase the book in person. If you choose to stock this book, please email: poemsandreflectionsllc@yahoo.com with your bookstore name and contact information. Poems And Reflections LLC will list your bookstore on its website as a local resource where this book can be purchased. 6. The book contains poems meant to comfort families beyond the funeral experience. A selection of grief and healing poems provide peace and perspective during the grieving process as well. 7. 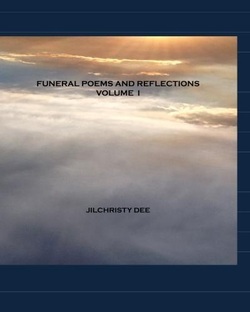 Funeral Poems And Reflections - Vol I has poems for most family members, including: grandmothers, grandfathers, mothers, fathers, daughters, sons, teenagers, children, adoptive children, foster children, and twins, in addition to its many poems that are general tributes for all. 8. Poems for different circumstances, such as: extended illnesses (including cancer), unexpected deaths, suicide, estrangement from a family member, missing a loved one during a special occasion, and patriotic/ military poems are included. Religious and non-religious poems are also a part of this book.